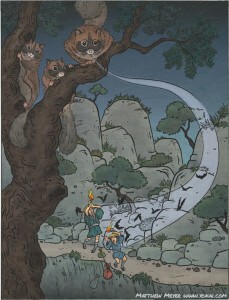 APPEARANCE: The nodeppō is an animal yokai which lives in northern Japan, deep in forested mountain valleys. Nodeppō resemble flying squirrels, but are actually born from an animal called a mami, which resembles a badger. When a mami reaches a very old age, it transforms into a nodeppō. 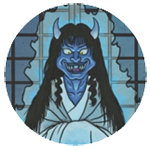 BEHAVIOR: Nodeppō very closely resembles nobusuma in appearance and behavior. They swoop down from trees at night, extinguishing flames. They latch on to humans’ faces, smothering them and sucking out their blood, and in many places they are considered to be the same creature. While both nodeppō and nobusuma like to smother people’s faces and blind them with their webbed arms and legs, the feature which most distinguishes the nodeppō from the nobusuma is also its namesake: the ability to shoot bats out of its mouth, like bullets from a gun. The nodeppō is able to spit a stream of bats out of its mouth towards the faces of its victims, blinding them in a cloud of angry bats.